HANG OUT with some incredible people. CINDY our newest for her C2 LINSANITY! MICHAEL LIANG our senior member with A6 Welcome Back Home from the public relations manual! Let's also hail the return of LOTUS, one of our joke queens! And the always thoughtful FREYJA will lead us in Table Topics! WE ARE MOVING TO ANOTHER AUDITORIUM! 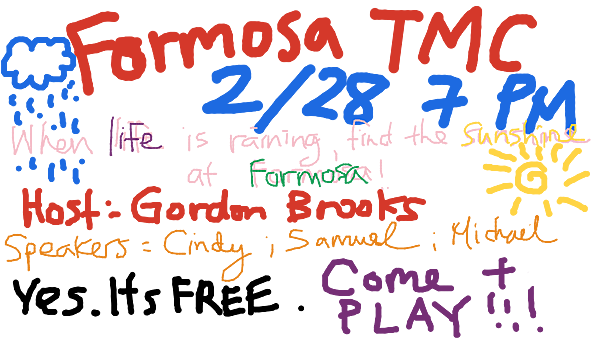 As Always, a Formosa Tradition: No Admission Fee for Anyone!! The Agenda for the Meeting is attached! Please Check Your Assignments and Bring Your Manuals! 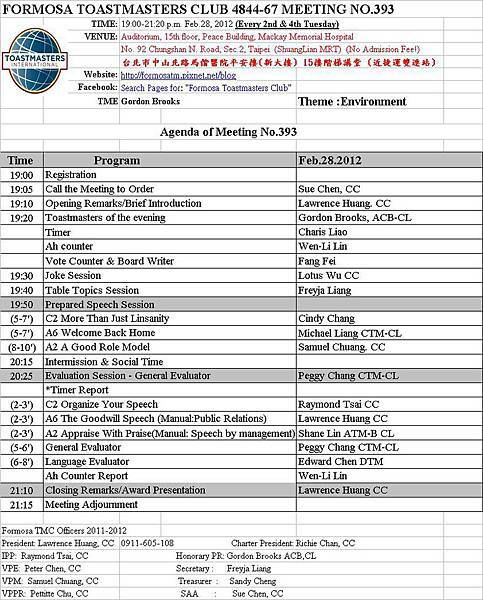 3/13 Prepared Speech and Table Topics In-House Contest!! Join the In-House Contest next month! Never been a TME before? Try it! Let's go- Let's ROCK THIS BOAT! Okay this email is way to BLACK AND WHITE FOR ME.